I am trying to implement a CardListEditor, following the steps in the document. But CardListEditorTemplateBase is not found. How can i add a reference ? Unfortunately, the document contains some mistakes. This template CardListEditorTemplateBase you have to create (yourself) and inherit from ICardTemplate. Says page is unresolved and when i add System.Web.UI reference, it gives error: type used like a variable. please ignore my earlier reply. a System.Web.Forms reference was added before that line, so it got mixed up. Still wroking on the solution. Finally i managed to compile the code. But when i opened the model editor, i could not see ASPxCardListEditor for the view. So i added the XafariEditorsWebModule to my Webmodule.cs designer. When i do that, i can not open the Model.DesignedDiffs.xafml file anymore. One or more errors encountered while loading the designer. The errors are listed below. Some errors can be fixed may require code or model changes. (915, 14): 'ModelMember' does not implement interface member 'Xafari.Editors.Model.IModelMemberSpinEdit.MinValue'. 'ModelMember.MinValue' cannot implement 'Xafari.Editors.Model.IModelMemberSpinEdit.MinValue' because it does not have the matching return type of 'string'. (915, 14): 'ModelMember' does not implement interface member 'Xafari.Editors.Model.IModelMemberSpinEdit.MaxValue'. 'ModelMember.MaxValue' cannot implement 'Xafari.Editors.Model.IModelMemberSpinEdit.MaxValue' because it does not have the matching return type of 'string'. The same error occurs if i try to add XafariEditorsWebModule to my WebApplication.cs designer. Model.xafml file can not open anymore. Would you please send us a simple sample where this issue is reproducible? Please note the cbValueRangeController in the Module.Web project. That's the controller causing the error while opening the Model.xafml file. When the application is running, controller works fine i guess. I will disable the controller for now, and get back to trying CardListEditor. In the meantime, i will be happy if you can suggest a solution. Message: Specified method is not supported. Forgot the screen shot in the previous message :) Here it is. Please reply asap, i have to get this working. 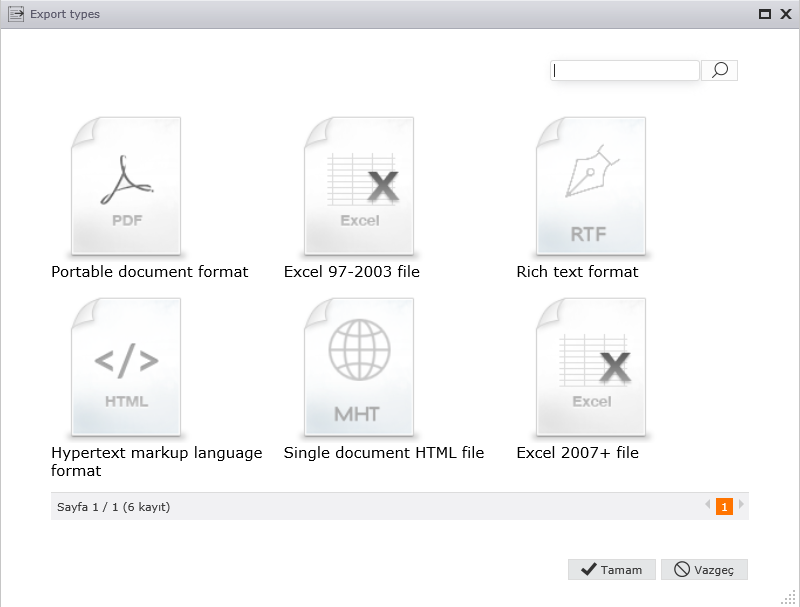 The problem with attaching files(.zip, .rar) solved. You can send us sample solution using function ‘attach a file’. And i forgot to mention in the previous post. The build Xafari v14.1.705 will be available on the website at the next week. The exact date will be informed additionally. Also, hope we can solve the selection problem in CardListEditor, it will be awesome. Give us some time to research this issue. We will get back to you as soon as we can. Please, see the sample project (attached file TestSolutionForCardLEd.zip) and ask your questions. This sample built similarly to document and your code with some fixes. You can download new version Xafari 14.1.705.4 in site galaktika-soft.com. Thanks a lot for the sample solution. I will try it asap. Also recevied a mail today about the new release. It directs me to the download page. Is license necessary? I purchased Xafari about afew weeks ago (order ##22417). When i did, i received a download link. Am i going to need any type of license ? The solution you provided worked. But when i adapted the files into my solution, result was the same again: Specified method is not supported. That was the trick. When i set it to client mode, worked smoothly. Fyi. As for license: you can load any version Xafari and use it loosely, if you have a license and the license is valid for the required period of time. I have a major problem with XafariEditors module i guess. You can find the screen shot of the error attached, along with a test project. Actually, the test project is the same one you sent me. 1. 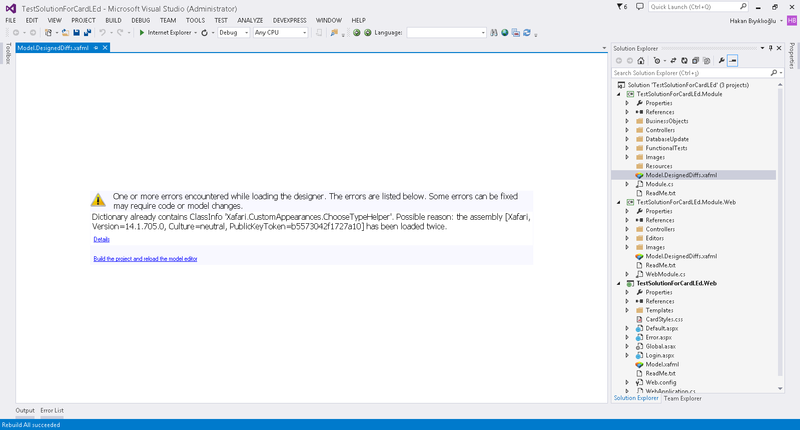 Open the solution in Visual Studio ( I am using 2013). 3. Double-click the Model.DesignedDiffs.xafml of the Module. 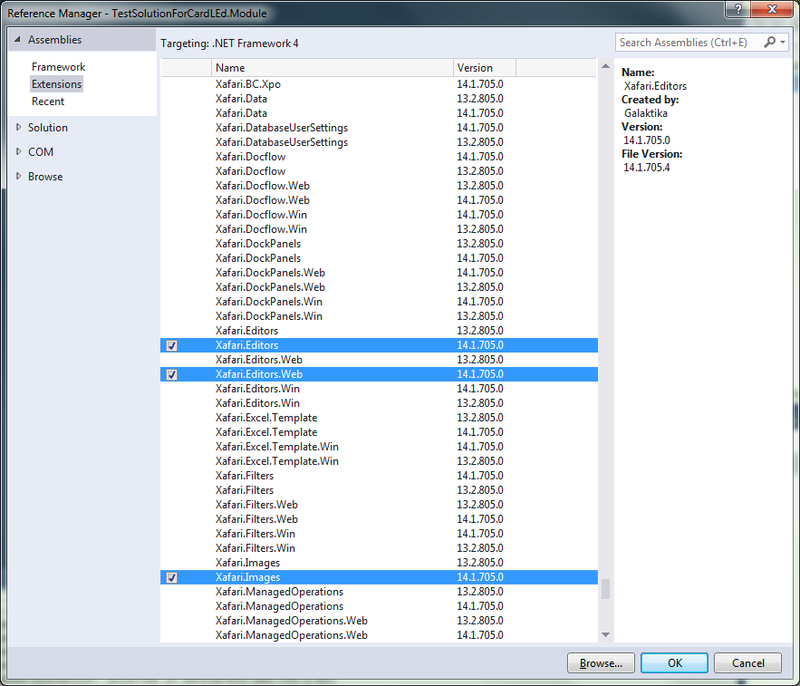 When i leave out the Xafari.Editors.dll module out of the project, there is no problem. I have to solve this urgently. Please, do the next steps: Clean Solution -> Build Solution -> Open your Model.DesignedDiffs.xafml. This manipulation can help you. Let me know whether it suits you or not. I have done that many times actually. But it does not help. You get the error either on the first time, or eventually. When you take out Xafari.Editors.dll module, everything works fine. I solved this problem when deleted a folder 'Refs' and added references from root framework (see attached file AddReference.png). Your issue (with adding a .dll (xafari) in a separate folder) requires further study. Thanks so much for figuring out the problem. Everything works fine now. Also ModelEditor when the solution is deployed. Here's a sample screenshot of another CardListEditor in the solution.